Poll results: Are you unhappy that Samsung ditched replaceable battery and expandable storage for the Galaxy S6? With the Galaxy S6 and S6 edge, Samsung finally took a bullet for the unibody team, and sealed off their battery compartments. Sixth time was the charm in the flagship Galaxy S line history that did away with Samsung's signature flexible design decision that gave you the chance to swap the battery at will if needed, or add extra storage via a microSD slot. On the other hand, we've got a new durable Li-pol battery type in the S6, plus it ships with 32 GB of internal memory out of the box, instead of the basic 16 GB so far. While proper battery tests are still to be made, the S6 won't be much farther than other flagships in terms of battery life, if Samsung's history and the official talk/standby times are any indication. Moreover, for the sake of a sealed-off battery, you get the thinnest, most premium metal-and-glass chassis in various reflective colors that Samsung has ever graced us with in the Galaxy S line, plus built-in wireless charging. This is why we asked you last week if you are unhappy that Samsung did away with its replaceable battery and expandable storage paradigm in the S6/S6 edge, or if you don't really care, as long as the battery life is decent and there is enough storage out of the box. Well, it turned out that a majority of our 3818 respondents think a flagship Samsung without removable battery and expandable storage is not a true Samsung flagship, while 38% of you replied that they don't mind as long as battery life and internal memory meet their marks. Are you unhappy that Samsung ditched replaceable battery and expandable storage for the Galaxy S6? I can't blame them. People are used to have removable battery and sd card slot for samsung device so it's a big change and risk that Samsung is doing. As they say bigger risk the higher the success. They reduced the battery because of the tech inside. First of all their 14 nm 64 bit CPU is using 35% less energy from the previous gen CPUs. Second their new and fastest DDR4 1552 MHz ram is using 34% less energy as well. Third the new UFS 2.0 storage is not only the fastest ever used in a device its also using 50% less energy compared to previous gen storage. Last but not least the display is not only packing more pixels, but is using 20% less energy. No wonder why Samsung is claiming that the new S6 with a 2550 mha battery will last longer then the S5 which had a 2800 mha battery. they could have just made the device slightly bigger , the s5 really wasn't a thick phone to begin with. the same size would have been ok. 2550 mah battery is low by 2015 standards of Android phones thats slightly less than even the s4 2600 mah. no matter how anyone spins it, the battery life will never match the s5. Strongly disagreed! Though I don't mind the non-replaceable battery, I don't like to take the mobile battery pack with me 7/24 neither. With all the Galaxy S high-end before S6, I only need to carry a small battery in my pocket as spare! This is cheaper and much lighter than a mobile battery pack! Since the built-in camera is so good, removable SD card allows the end-users to easily transfer the photos to other devices. Hence, the photo can be easily viewed on notebook PCs or tablets by transferring (unplug and plug) the SD card to a slot on any notebook PC or tablet with or without the uSD-SD bridge. This is very fool-proof because no software is needed. I can store tons of soap opera episodes or sport program into a micro-SD card. 64Gbytes of professional grade uSD card cost as low as US$27. Instead, Apple charges me an arm and a leg for a cheap but reliable function! Not to mention, in 2 years time, I can pass the S5 to my daughter for watching movies or ... while she is on the go. I only need to spend a reasonable amount of money to buy a new battery pack. I may have to spend a fortune with Samsung in order to replace the nearly worn-down battery inside the Galaxy S6! I don't care about replaceable battery and SD card slot (not need it). I care about battery life. According to GSMArena test it's worse than S5 and that's really bad (step backward). Let's wait for final unit tests and judge. +1 I don't like that people likes so thin devices. 8-9mm is good enough. Even a little more with profiled back would be ok.
Read my comment again. Did I write that people don't like thin devices? That they won't sell it? No. I just wrote that I don't like so thin devices and this is my personal opinion. thats sounds like the best idea !!! weird I' even saying that, it's common sense but unfortuantetly every manufacturer is acting dumb , why a protruding camera in the first place ? thicker phone = bigger battery + no annoying camera bulge. hope even Apple stops this B.S. Agree with your assessment about S6. Let see the actual sales of S6. In the mean time I will buy other phone that have these two features. We will know the result coming Nov or Dec 15. 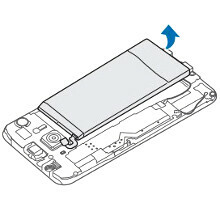 The removable battery, along with scrapping sd support took away major flexibility. A lot of Samsung users won't like, but will get used to it. Don't care either way... as long as they don't do the same thing to the Note 5!!! For all the times my wife has had to do a battery pull to reset her frozen/crashed S5 and as much onboard music as she likes to have, the S6 won't do. She's been becoming decreasing dissatisfied with it since she got it as a replacement for her S3. It's gotten so bad we went to the Microsoft Store on Saturday where she tried a few Lumias and the Band and came away - admittedly begrudgingly - very impressed, though she couldn't find a phone that felt quite "right", so we're going to reset my Lumia 925 and have her give it a try, and if she likes it as a daily driver, we'll get her one of the Windows 10 flagship phones in late summer or fall. If you're worried about the ability to do a battery pull, or simulate it, you can still do that on phones with non removable batteries. Why even do these polls! There just gonna do what they want anyway and besides that were just an experiment.